Every year in late winter New Orleans puts on a grand party like no other. It’s a rainbow-hued, glittering, skanky, riotous celebration of everything there is to celebrate, flowing in and out like a shiny snake amidst the flower-strewn, humidity-drenched, decaying streets of the French Quarter. Mardi Gras may present a polite, rich veneer of real orange blossom and vanilla, like a southern belle delicately munching on a beignet dusted with powdered sugar, but behind the pretty, festive costume are dark undercurrents of voodoo and hoodoo, midnight rituals and outrageous secrets that can only be unleashed under the protective camouflage of the innocent-looking mask. Olympic Orchids' description of Mardi Gras1 is pretty apt; this perfume throws open the curtain on a sullied orange blossom — half dressed, distressed and a bit sweaty. Though Olympic Orchids Perfumes is based in my backyard (almost), I hadn't smelled any of their fragrances until last summer. On a trip to San Francisco, I got to sniff several perfumes from the extensive line and when I got home, I reviewed a perfume from the indie line Zoologist called Bat, developed by Olympic Orchids' founder/perfumer, Ellen Covey. Mardi Gras begins by smelling like a dark, simmered orange blossom elixir, sweetened with a leathery vanilla pod. The medicinal phase of Mardi Gras also contains a short-lived pharmacologic-camphoric note. What follows the opening is a hot mess; and I mean that in the best possible way! There's a sinister musk note, some "aged" neroli, a floral-scented lollipop I imagine looks like a chunk of amber stuck on a twig of Harry Lauder's Walking Stick. What I like best about Mardi Gras is that it never subjects its orange blossom to a lathery scrub in a hot bath. Even in its base, Mardi Gras' orange blossom isn't soapy — it's "hefty" and cloudy, almost smoky, in character (like flower incense from India). If you love the scent of strong orange blossom, sweet orange blossom, "chubby" orange blossom, do try Mardi Gras; it has good sillage and lasting power and is unisex. Olympic Orchids Mardi Gras is $65 for 30 ml and is available at Olympic Orchids Perfumes website or Tigerlily Perfumery. 1. Listed notes of orange blossom, neroli, cistus, benzoin, vanilla, civet, special musk blend. 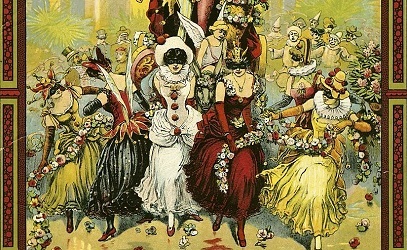 Note: top image is "The Carnival King" March & Two-Step, sheet music cover [cropped] via Wikimedia Commons. This sounds fabulous – one of my favorite perfumes is SSS Jour Ensoleillé, which to me smells mostly of “dirty” orange blossom. Have you tried JE, and if so do you think Mardi Gras is at all similar? Plus, love the 30ml bottles! Bastet, nope, haven’t tried that one…if only everything came in 30 ml! Ellen Covey is at her finest when she’s working with “complicated” scenes, characters, or creatures: dark yet light, innocent yet sinful, or, like “Bat”, cute yet creepy. She really creates rich, quirky perfumes. Bland, one-dimensional candy scents will never emerge from her studio! You know what I mean if you’ve tried anything from her “Devilscent” series…. Masha…I have so many more to try. Kevin, since it’s a bit late for the main post, I hope you won’t mind if I mention here that I just got an e-mail from HauteLook indicating that they have selected Kiehl’s and Diptyque items on sale. PS – Mardi Gras sounds really interesting! I found the first Olympic Orchards that I tried, several years ago, too sweet, but I should clearly give them another try. Noz, try some of the woody-resinous scents. Oh, Noz, how could you ? Just bought two bottles of cologne and a candle! Ha! My work is done here! I love Olympic Orchids but this is one of the five or six I haven’t managed to sample. Guess I’ll need to place an order soon because I adore her weirder scents and this sounds pretty strange.